Figure or image candles are a wonderful tool to have in your trunk! Unfortunately they can be costly and created from inferior waxes and ingredients. This can give them an unauthentic and vacant feel. No ashe' means weak or unsuccessful outcomes for your workings. My hand poured figure candles make these luxuries accessible for us all! I even load them for you in the age old root worker tradition! Your candle will be created just for YOUR needs and loaded with the herbs and minerals needed to achieve your goal! 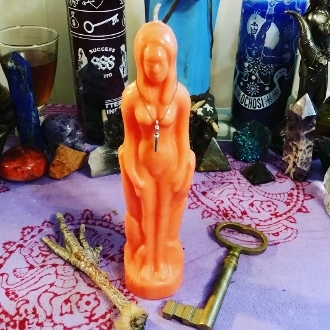 Figure candles are used to represent yourself or the person your working is intended for. These candles can be used to heal, to draw love, to protect, to bring abundance and more. Choose the gender of the person you wish to affect or target with your working and the color which corresponds to your working. You will receive ONE, custom loaded, hand poured, authentic, 7.5 inch tall figure candle. Thanks for looking! Curio only. Always exercise caution with candles.